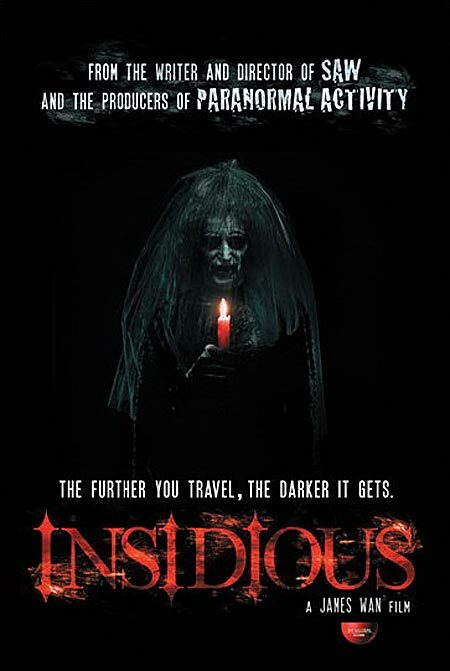 ‘Insidious’, directed by James Wan (‘Saw’ (2004), ‘Dead Silence’ (2007)), is one of those few psychological horror films that are genuinely scary without sliding into ridiculousness or downright dullness, and that also provides for a very good entertainment in terms of fascinating subject matter, gripping plot, good acting and great sound effects. In ‘Insidious’ the plot centres on the Lambert family, who recently moved into their new house. After Dalton Lambert (Ty Simpkins), a small boy, has a falling accident in the attic, and mysteriously slips into a coma, strange things start to happen in the Lambert family’s new house. When Dalton’s mother, Renai and father, Josh (Rose Byrne and Patrick Wilson) start to investigate the causes and nature of strange apparitions and noises, they soon discover that their child’s endless sleep has more to do with the house’s haunting state than they have ever dared to guess. The movie can be seen as divided into two parts, and the first part is, arguably, more impressive and realistic than the second. In the first part, we see the Lambert family’s tragic realisation of their son’s condition and their house’s haunted nature. Here, the audience is absorbed into Lamberts’ daily-activities, and it is genuinely scary to watch the arising “paranormal” threat posed to the family. This effect is achieved by maintaining the atmosphere of pure suspense and fright, and the film succeeds in instilling a sense of apprehension and fear, and building tension to the limit. Music (Joseph Bishara’s scary score) and camera-work add to this “creepiness” effect, and one is reminded of Bryan Bertino’s ‘The Strangers’ (2008), which uses the same technique successfully. Camera rotates and circles the house and Dalton’s room; closes up and moves away, contributing greatly to the effect of unknown and terrifying lurking beneath the home’s welcoming façade. The good acting in the film adds to the film’s merit. Rose Byrne as Dalton’s mother is very good in showing confusion, distress and terror as the full consequences of Dalton’s accident slowly sink in, and Patrick Wilson, as Dalton’s father, comes off almost as ‘”eerie” as the surrounding circumstances, as his own related past comes back to haunt him. The surprising, but very much welcomed, cast here is Barbara Hershey who plays Lorraine Lambert; she is the first to warn the family of potential dangers hidden in Dalton’s room. The second part of the film is more problematic and is, undoubtedly, the weakest link. Half-way through the film, the couple, greatly saddened by strange occurrences in their houses, invites spiritual investigators and a friend of Lorraine, expert in the paranormal field, Elise Rainier (Lin Shaye). Unfortunately, it is at this point that the film changes its tone (including the colour) and turns quite humorous, with the two funny ghostbusters joking about, and the whole affair turning suddenly quite comical. While for some viewers this provides a nice break and a chance to illicit a few good laughs, this turn is also very disappointing, because it completely ruins the intense, serious, suspenseful, quite scary set-up, which the film was trying so hard to achieve in the beginning. At this point, strangely enough, all the paranormal, ghostly appearances stop as the investigation is under way. And, if that was not enough, as the film progresses, it gets even worse. We see lazy, cartoonish, cliché representations of the “other” world – “the Further”, which is, if not completely laughable, remains no way near being scary. On the positive side, Lin Shaye as Elise Rainier, an expert in the field of paranormal, is quite a character here, and Shaye demonstrates some good acting in portraying an eccentric medium. Contrary to what many people say, the ending is actually refreshing, unpredictable (at least to some extent) and rather scary. It feels complete: not in the sense that there will never be any sequels, because there is already one under way – ‘Insidious, Chapter Two’ (2013), but because the ending feels satisfying in a thought-provoking way. One only hopes that the sequel will live up to the quality of ‘Insidious’, and incorporate techniques which we have already seen working. The possibility of astral projection (an out-of-body-experience, where a spiritual body leaves a physical one to travel to other places while a person is asleep) features heavily in the film, and this is where ‘Insidious’ stands out from all other “haunted-house” horror movies. The representation of astral projection here is also relatively accurate. The film clearly shows what happens when an astral body leaves a physical one, and the psychological effect it may have on a person. Apart from that, ‘Insidious’ uses a wide variety of material – from South African ancient legends, describing out-of-body experience, to modern-day statements of astral projection travellers. For example, demon-like beings haunting the “other side” (dream-world) is the event which is reported most frequently by astral projection travellers, and the movie wastes not time incorporating this. The legend of the Old Hag, now translated into the “Old Hag” syndrome, is the one on which James Wan relies most heavily. Sufferers of this syndrome wake up to find that they cannot move, even though they can see, hear, feel and smell. Most report a great weight put on their chests, and a sense that there is someone sinister and evil present in the room with them. The ancient belief says that this is the Old Hag “riding” the sleeper’s back. I really liked Insidious, great film and cant wait for the sequel! Great review! I’m glad you mentioned Joseph Bishara’s score. I thought it was one of the best I’ve heard in a horror film actually. He also did the score for Dark Skies which was pretty effective as well. Incidentally, he also the actor who plays the “Lipstick-Face” Demon in this. Scary guy!! Super excited for the sequel, absolutely adored the first. Also, I am really looking forward to the Conjuring also by James Wan. Great review and site, I am now following, recently started my own film blog and would love it if you could check it out. Insidious made me an insomniac for 42 hours And I swear to god it’s because Darth Maul makes a cameo. There’s nothing more terrifying than seeing characters from the Star Wars prequels in a horror film. Insidious 2 better not have jar jar bink roaming the set because that would just make me comatose. The exact words that I have been wanting to write but never had the words to organize my thoughts.. But absolutely yes, this movie is psychologically delicious. It plays with our mind, and how genuine our imaginations could be. The second part of the movie actually, I think, the circle scene, with the investigators, was just there to make it more eerie, you know, too much horrific scenes could spoil the film. Thumbs up! This movie is really creepy and James Wan makes use of incredible atmospherics. Great camerawork, great pacing…and then there’s the second half. “Insidious” may be called ‘supposed to be,’ but for some, like myself, it’s already enough. I really liked Insidious. Every once in awhile a horror movie sticks out above the mass of predictable crap. This is one of them. James Wan is great. Great Review. I enjoyed Insidious to a point, but found the last 25 mins totally feel apart. I think James Wan nails aspects of horror so well but fails at concluding a story convincingly without cliché or reaching for the obvious. I feel the same short-comings harboured ‘The Conjuring’ as well. Drop by http://www.moviereviewworld.com sometime if you get the chance. Thanks a lot for your comment. Yeah, that’s exactly what is the matter with ‘The Conjuring’ and ‘Insidious’. Even if James Wan had sequels in mind, there was surely no excuse for ‘lets-just-wrap-it-up-as-soon-as-possible-no-matter-how-clumsy’ endings. Agreed. Great site btw, enjoying it a lot.